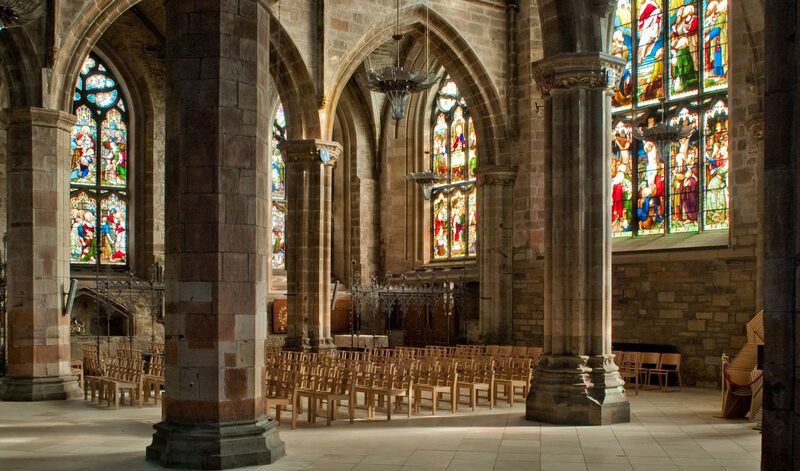 The congregation plays an important role in the life of St Giles’ Cathedral. On this page you will find news and updates which may be of interest to the church community, including the quarterly newsletter and intimations from services. St Giles’ at Six at 6pm on Sunday will be an organ concert featuring Marcel Dupré’s Symphonie-Passion, given by Paul Stubbings. The Evening Service at 8pm on Sunday will be a service of Holy Communion. The Rev Helen Alexander will preside and preach. We are grateful for the support of The Friends of the Music in enabling the use of the brass ensemble in this morning’s services. Due to the Council’s ‘Open Streets’ pedestrianisation of the Royal Mile on Sunday May 5th, parking will not be available in Parliament Square except for blue badge holders who should be granted access. Parking will be available on surrounding streets and George IV Bridge will be open to traffic. Journeys in the Spirit: Reflections on Poetry and Prayer The Rev Helen Alexander will be in conversation with Janet Morley writer and workshop leader on Saturday 27th April at 5.30pm in St Giles’. Admission is free and all are welcome. St Giles’ at Six at 6pm on Sunday, Music for Passiontide, featuring Maurice Duruflé’s Requiem with motets by Marcel Dupré and Francis Poulenc, will be given by the Cathedral Choir. The Preacher at the Evening Service at 8pm on Sunday will be The Rev Craig Meek. You are invited today to join the ecumenical Palm Sunday “processional” service, leaving the Mercat Cross at 2pm and finishing in the grounds of the Abbey at Holyroodhouse around 3pm. Organised and led by Old St Paul’s, St Patrick’s and Canongate, all are welcome to join in. Order of service includes a reading, a prayer and a Taizé-style hymn at 5 on the route. Holy Week Services will take place this week Monday 15 – Friday 19 April at 8pm with hymns, choir and sermons on ‘Sacred Spaces’. There will be a service of Holy Communion at 8am on Wednesday 17 and on Good Friday when the Midday service will be extended to include hymns and the reading of The Passion. The Convener of Flowers would be grateful for donations of daffodils for the Easter decoration of the church, on Saturday 20th April, 10am-12 noon. Anyone willing to help with arranging the flowers would be very welcome! Journeys in the Spirit: Reflections on Poetry and Prayer The Rev Helen Alexander will be in conversation with Janet Morley, writer and workshop leader, on Saturday 27th April at 5.30pm in St Giles’. Admission is free and all are welcome. Janet Morley will preach on Sunday 28th April at 11.30am. (11.30am) The guest preacher this morning is The Rev Dr Liam Fraser, Church of Scotland Campus Minister at The University of Edinburgh. St Giles’ at Six at 6pm today will be a piano recital given by Adam Heron. The Evening Service at 8pm today will be a service of Holy Communion. The Rev Prof Kenneth M Boyd will preside and preach. Old St Paul’s Church, Jeffrey Street, invites you to “Music for Lent: Miserere” sung by the Choir of Old St Paul’s (director John Kitchen, speaker Richard Holloway) on Friday 5 April at 7.30pm. Tickets £10 (£8) on the door.